SATURDAY DAY PASS – The Peach Music Festival is back and it's better than ever before! With the likes of The String Cheese Incident, Phil Lesh & Friends, Lettuce, Blues Traveler, Steven Marley and so many more set to perform – it's already turning out to be one of the highlights for the summer! You can now book your tickets for the Saturday event as it takes place at Pavilion at Montage Mountain on 27th July 2019! Click here to secure yours! The 2019 Peach Music Festival line up has NOW been announced! It's about to get exciting! You can expect to catch performances from Phil Lesh & Friends featuring Warren Haynes, John Scofield and John Molo who will take to the stage to play two performances at the festival as will the Trey Anastasio Band. 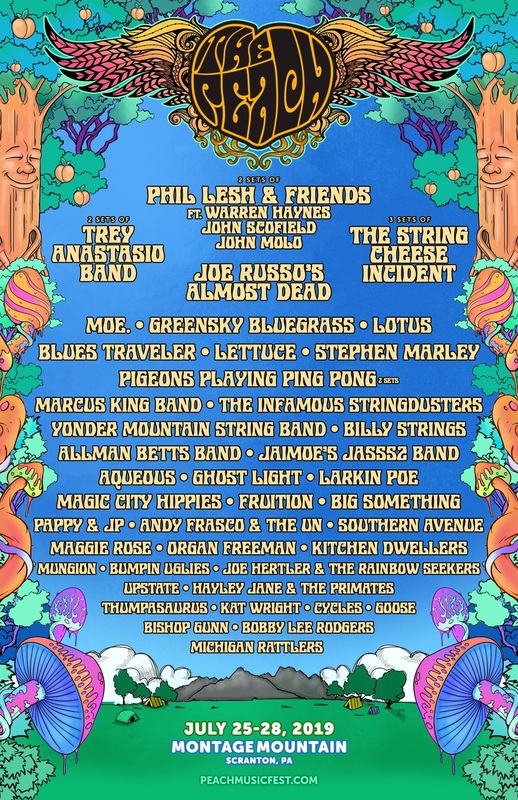 Other acts include; The String Cheese Incident, Joe Russo’s Almost Dead, moe., Greensky Bluegrass, Lettuce, Blues Traveler, Lotus, Stephen Marley, Pigeons Playing Ping Pong and the Marcus King Band! There's no time like the presence to get your summer schedule up to date! Come and enjoy The Peach Music Festival 2019 as it brings an incredible selection of talents to the Pavilion at Montage Mountain for one whole weekend! With the very best names in music right now, across the genre's from jam band, to livetronica, bluegrass, rock, country, psychedelia and even some reggae! It's no surprise that thousands gather every year to see what Peach Music Festival has in store. The Peach Music Festival is renowned for it's incredible line-up and every year it gets bigger and better than before! Previous acts have included; Greg Allman, Toots & The Maytals, The Floozies, Widespread Panic, The String Cheese Incident and more! Book your passes online today for Montage Mountains most talked about event of the year!